When I first met the Burke fans, I decided to brush up on Tom’s theatrical career. I read all of the plays that were listed on Wikipedia that he had performed in. 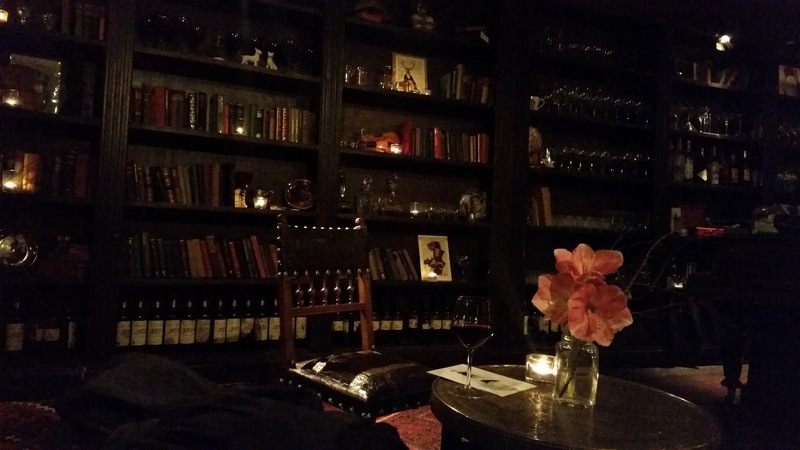 There were playwrights I had heard of, and some I hadn’t; it was an interesting education. At the time, I wrote up my thoughts on the plays on this blog, and I now think it would be interesting to revisit those thoughts at some point. I’ve now got used to reading plays, and then watching them being performed, and so I notice things now that perhaps back then I missed when just reading the plays. One of the playwrights I enjoyed reading was Howard Barker. I particularly loved Scenes From An Execution, not least because it is set in Venice, a city I love and have fond memories of. 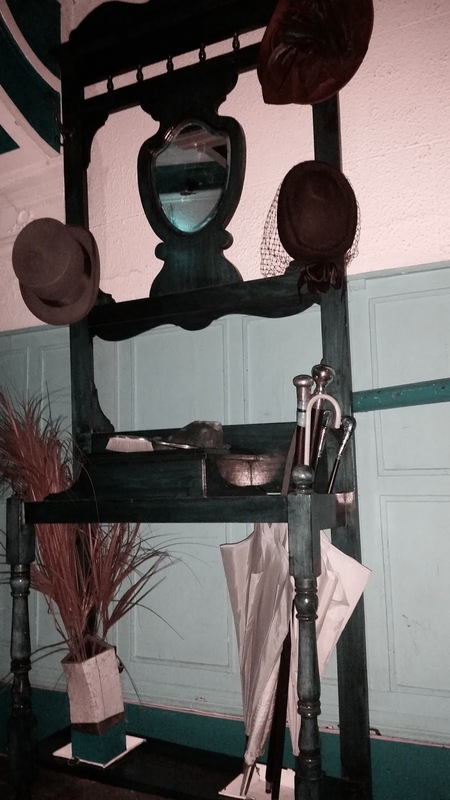 My friend Nikki saw that one of Barker’s plays was being performed in London and we were a little undecided as to whether we could see it because we had already booked to see a play in Manchester the following day. 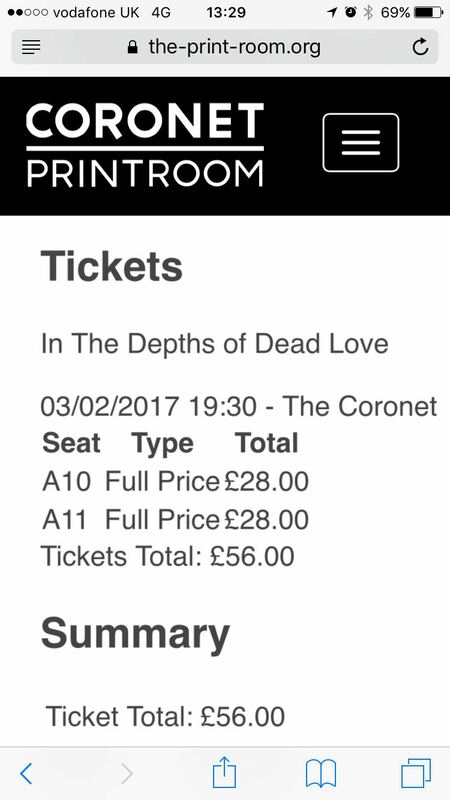 We decided it was doable, it isn’t often that you get the chance to see Barker performed, and so we booked to see In the Depths of Dead Love at The Printworks, London. 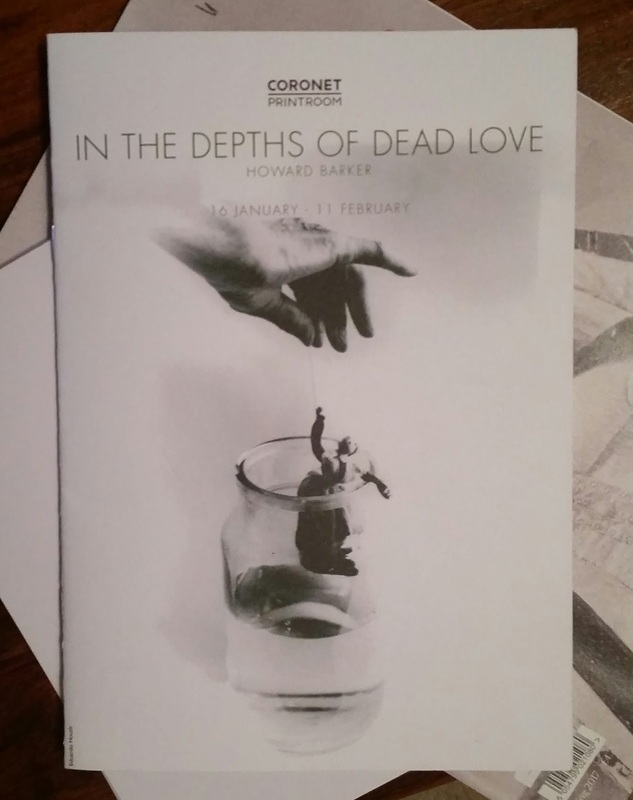 In The Depths of Dead Love – Howard Barker. 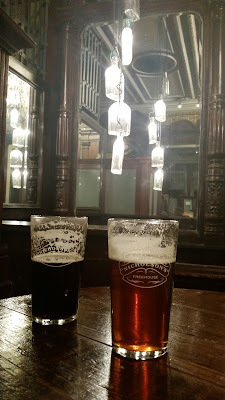 Our night started in The Flying Horse Pub where we sank some pints of Doombar and then headed off towards The Coronet Theatre. 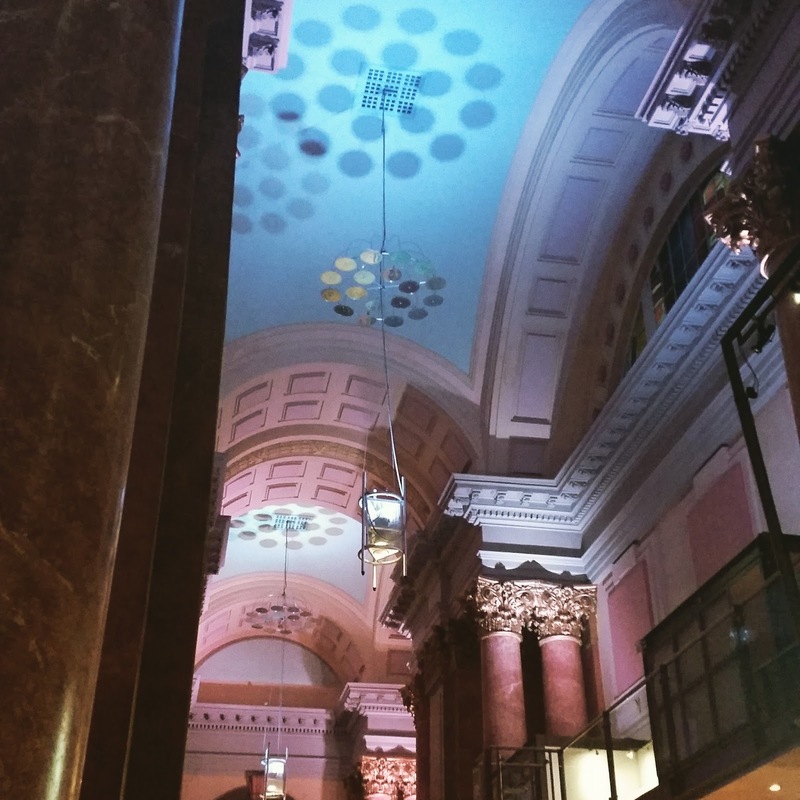 I was spellbound as I walked towards the front doors, what an amazing building! It was opened as a theatre in 1898 but in 1923 the building became a full-time cinema. The cinema featured in several films, including Notting Hill, and it has had the Sword of Damocles hanging over its head on a number of occasions. 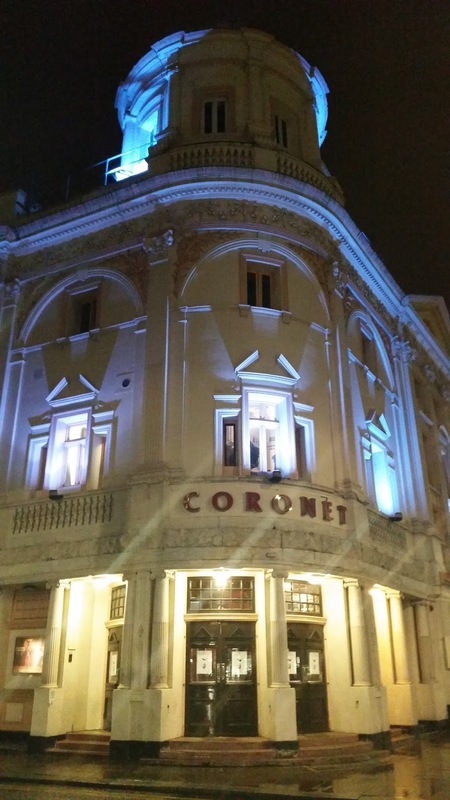 In the 1990’s The Coronet nearly closed its doors to be turned into a McDonalds, I shiver at the thought, but thanks to the likes of the late Alan Rickman, Joanna Lumley and Gillian Anderson, the theatre is now a Grade ll listed building, and theatre still plays on there. We took a walk around the Coronet's narrow, dark, winding corridors and went downstairs to the bar. 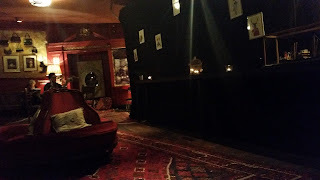 It was dark and like a Victorian parlour. I loved it. It appealed to my very core. I grabbed a bottle of beer from the fridge (which had a feather glued to the front of it) and paid the man behind the piano…yes I said piano! I then went and sat on a bed in the middle of the room to take in my surroundings. The play was a simplistic affair. We’d spoken to someone pre-play who said they often left half way through plays and doubted they would watch all of this, especially as it was Barker; a playwright renowned for his plays not having a specific message – you just take what you want from them. The stage was a plain affair, to go with the simplicity of the storyline. Set in China, In the Depths of Dead Love tells the tale of Chin, a former poet in exile, who bought a bottomless well. People pay to visit the well, they may wish to throw themselves in, if they decide not to, then they have pay to leave as well. One frequent visitor is Lady Hasi, she wants to die but cannot bring herself to throw herself in. Her husband, Lord Ghang, visits Chin and tells him "So shove her" "SHOVE HER / SHOVE HER IN THE BACK." Chin is outraged. His sense of poetry and language has been sullied, not the fact that Lord Ghang is basically telling Chin to murder his wife, but the use of the word SHOVE?! The play is easy to watch, despite the dark theme of suicide. Barker has written it with beautifully poetic language and he takes on a humorous approach to the nature of Lady Hasi’s suffering. She clearly has this desire for death, but Chin focuses on Lord Ghang’s incorrect use of language, and what words he should have used instead. I thought that this, rather than being an incidental aside, showed that perhaps Chin was also suffering in this life, that perhaps he was filled with hopelessness now he no longer had his poetry, and he desired “this life” to be taken away from him for something better. He sits, every day, next to the thing which can offer him sweet oblivion, but he just sits and watches others take the opportunity to battle their conscience. When we left the theatre, my friend and I bumped into the men who “would probably leave early.” We said, “So you stayed to the end then?” and we then struck up a chat about the play. It’s the first time I’ve ever stopped and discussed a play with a stranger when leaving the theatre…but this is the effect of Howard Barker. The play is not a cut and dried tale with a right or wrong reaction. It is an emotive piece inciting discussion. Barker describes his work as The Theatre of Catastrophe. He does not clarify a scene, he leaves ambiguity, he allows the audience the right to think and discuss what they’ve seen, to explore and consider Barker’s themes of violence, human motivation and quests for power. And so we left the theatre, and over pizza, Nikki and I discussed our thoughts. The play showed suffering and endurance from all three principal characters. Chin had been a successful poet, now he charges people to visit his well, he endures people coming in day after day toying with their conscience as to whether they wish to live or die. He watches people suffering; Lady Hasi desires death more than she desires her husband. Lord Ghang has the ability to show his wife affection in death but not in life. Is this why she wishes to end it all? Death is inevitable, we all die, but it is how we face death. 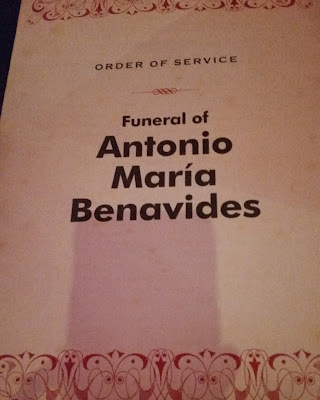 And death doesn’t have to be the physical act of no longer breathing and terminating our life…metaphorically speaking it could be the death of an old life we no longer want, and the birth of a new life…a new beginning, the quest to finish our lives on a different path to the one we started on. Having watched and enjoyed the play, I was disappointed to read reviews which concentrated on the fact that whilst the play is set in China, all four of the actors were white. I thought that the play was not a literal interpretation of life in China and thus necessitating Chinese actors; the play could easily have been set in a Swiss clinic where the question of assisted suicide could be discussed; but the setting in China is important, it allows for a more poetic feel. The play suddenly takes on a wider meaning, more questions can be asked rather than concentrating on the suicide element of the play. The bottomless well is where people stand on the periphery, where they feel scared, where they don’t know what to do and need a helping hand, a push towards a new experience. The well is an allegory; Lady Hasi thinks she needs a push to help her face her fears. As we move through life we sometimes need a push, either physically or mentally. If we are scared of the unknown, it is easy to take a step back, to not take a chance and walk into it, but sometimes we get a helping hand…a friend will give us the push we need to face our demons, to give us the confidence to do the things we thought we never could. And THAT is why I am a fan of Howard Barker…his ambiguity can make you go through so many levels in the thought process and invite a night of deep discussion, and like the well, the conversation can be without an ending! Saturday dawns and its goodbye London, hello Manchester. There’s a bit of time to kill though before our train leaves, so seeing as Tottenham Court Road underground is en route to Euston, we stopped off at The Flying Horse which now seems to have become my local (I never get the chance to go to a proper “pubby” pub at home…they’ve all been turned into gastro pubs or I’m usually driving) so I take the opportunity to sink a rather nice pint whilst Nikki sensibly reawakens on extremely good coffee! After a snoozle on the train we arrive at Manchester Piccadilly and head down to the Royal Exchange. The streets look really pretty decked out with Chinese red lanterns in celebration of the Chinese New Year. It is a straightforward tale; we enter the house of Bernarda Alba following the funeral of her husband Antonio Maria Benavides. We enter an all-female household, and Bernarda is the matriarch who rules with a rod of iron. As with all families, each of her 5 daughters are different, some are more headstrong and outspoken, others quietly frustrated at their eight year confinement (mourning period) and their inability to be allowed to fall in love and lead the life they want to lead. As always with a group of women there is the inevitable one-upmanship and spiteful comments! As each scene plays out, the suffocating grip that Bernarda has placed on her daughters starts to show cracks. Her more headstrong daughters are becoming defiant. The play is at times dark and tragic, but the performances keep you on the edge of your seat until the end of the play. Kathryn Hunter who plays Bernarda is truly believable as this ageing woman who still needs to exert her control, who never smiles, and who makes her daughters lives a misery because they are too scared to confront her. I found trying to write about this performance difficult, I didn't want to sound patronising, and I found it hard to articulate my feelings after watching the play as well. In contrast to the night before where we couldn’t stop talking, after this performance both of us were quietly reflective. The staging was absorbing, the acting was superb with some notable outstanding performances, and the play had been cleverly rewritten so that conversations were clarified to the audience but still sounded like the normal flow of siblings conversing with each other. This was still Lorca's play and I enjoyed it because it stayed true to the narrative. I really enjoyed the play on many levels and would recommend going to see it if you have the chance, but you need to be quick as it finishes its run on the 25th February!